Last night was cold. Freezing. The type of weather where the only place you want to be is at home wrapped up warm in front of a fire, not the kind of night you would imagine yourself outside in a car park in Dalston. 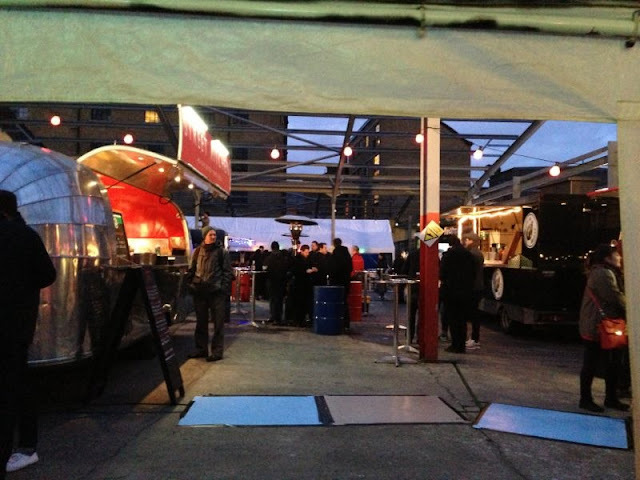 That is unless some of the hottest street food trucks London has to offer & ice cold Brooklyn beer's are brought together by Street Feast London for a night that's sure to lead to over indulgence. 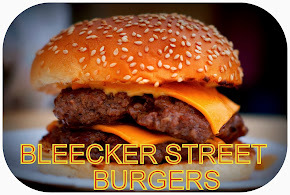 One of the major reasons we booked tickets was for Mrs Burger Addict to finally sample one of my 10/10 burgers: The Double Cheeseburger at Bleecker St. Burger. I had been talking & talking about it since my first visit in early December and raving since my second visit in January. Sadly working outside London she doesn't have the luck us city workers have with KERB a few times a week & was yet to try this delight of a burger. All 5 of us in our group had the double cheeseburger. The sounds on the table, probably more suited to the bedroom, were confirmation of the quality on its own. 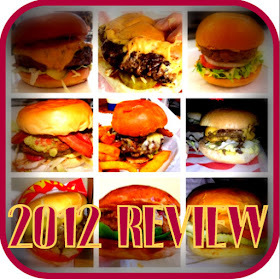 Unanimously we agreed it's one of the best burgers around. Some hailing it the best burger they've had. The angry fries were stunning - Zan continually delivers. Well Kneaded bringing you sourdough firebread - basically pizza on a sourdough base. I had 2 slices from here, both chorizo, leak and cheddar. The first was without parmesan and was delicious. The base was a delightful change, the toppings stood out on their own and worked collectively - I had even said it was on the same level as my favourites Pizza Pilgrims. The second was nowhere near as good - in fact it was poor. The parmesan was far too strong and completely took over. It was all that could be tasted unfortunately. Only a minor adjustment needed here however and they showed on my first slice they can provide a pizza to rival even the best. Looking forward to trying them again. I've been to Luardos on Whitecross street market numerous times in the past year, however they 'only' sell burritos - almost definitely one of the best burritos I've had mind you, but unfortunately their signature dish the fish taco isn't available there. Tonight's the night I finally get to sample it. The fish taco (£3.50) is beer battered coley, mango salsa, chipotle, coriander, special sauce, shredded sesame cabbage, avocado on a corn tortilla. The individual flavours are bold, fresh and distinctive and the mango salsa was excellent. I would have preferred the avocado smaller; the large slices made it difficult to wrap it into the taco. Tasty, but it didn't quite reach the highs of the burrito for me. 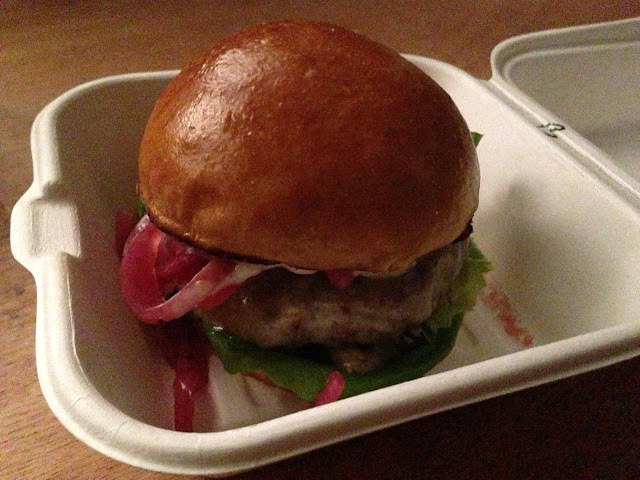 Next up was another one of the top burgers London has to offer, this time in mini size, the Buffalo Bill. Mark Jankel of Street Kitchen and Patty & Bun was busy working away yet had time to tell me they have a new location for their airstream coming next week in Shoreditch and they may be having a reduction in price for the opening week. I asked Mark if the wings were different to the wings he cooks at Patty & Bun and with a cheeky smile he said they were better. I was very lucky to get the last batch of wings available. There was a crispier coating to them with a slightly deeper flavour, but very minimal difference to Patty & Bun - No complaints from me there. The burger was a smaller replica of the Buffalo Bill I had previously - The only difference being the bun had slightly less bounce and subsequently a bit dryer. Making something smaller taste so similar isn't an easy task I'd imagine and it was a superb effort. The bar was booming all night. Sadly a request for something other than beer was laughed at which didn't please the non beer drinking girls in the group. I didn't particularly need confirmation that I was at a Brooklyn Brewery collaboration, but not offering a non-alcoholic drink is quite poor - What if someone was pregnant after purchasing a ticket, would they have been advised not to attend? The 2 beers I had were tasty and with the added bonus of the temperature they stayed cold whilst in the queues for food. With plenty of seating and 'some' space this was much more fun then my last street food night at We Feast. The atmosphere was relaxed and the music wasn't offensively loud and could be heard quite comfortably without being deafening for anyone close by. Ticket were £6 which included a beer and one of the £3.50 sample dishes from the food trucks - ticket pays for itself and with 4 out of the 8 food trucks hit I went home happy with my love for night street food back. 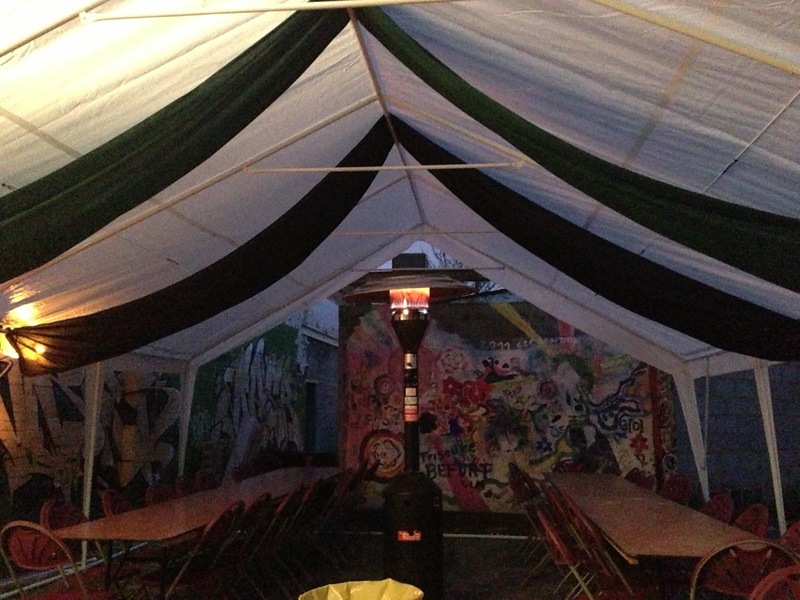 Keep a look out for what Street Feast London do next.